The Councillor of Development, Infrastructure and Tourism of Estepona, Ana Velasco, confirmed that half of the sections of the coast corridor linking the entire coast of the municipality by a walk by the sea, are undergoing construction work, as Grupo Diario Area said. Some, such as connecting Cabo Bermejo and the Residence San Jaime, or linking Fireplace and Playa Bella by a wooden walkway, are complete. The first involved an investment of 60,300 euros, while the second has had a budget of 596,000 euros. Soon, construction work will start in the other sections such as Kempinski Hotel-Laguna Village, 274 meters, including a wooden bridge over the River Padron, new access to the beach, adequacy of gardens and street lighting will be tendered. The layout Mar Azul-Kempinski will be completed in the coming days, like Blu-Alcazaba Beach Sea, which is being run by the owners. In the coming days the stretch Alcazaba Beach-Pinillos also will start, with a budget of 64,300 euros to build a concrete walk. The City is also working on the second phase, which will connect three kilometers off the east coast, and has asked by the Association of Municipalities of the Costa del Sol preparing the Benamara-Matas Verdes, Isdabe-Atalaya and Guadalmina-Casasola projects . 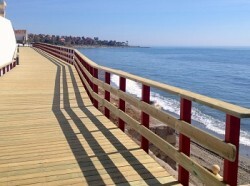 The coastal corridor of Estepona, consisting of 12 sections, continuously join the 22 kilometers of coast town, putting spaces in value so far bad communicated and inaccessible. Residents can get around on foot or bicycle. The project will promote employment in the construction sector and generate new jobs resulting from tourism, when completed. The total budget for all of the projects is of 4.8 million euros, funded by the Consortium Qualifica.